What Are Microservices and Service Discoveries? A service discovery is a key element of service-oriented architectures that uses network protocols to automatically detect devices and services. These devices and services use language-agnostic APIs, allowing for software companies to use the devices and services of others without the continuation of user intervention. 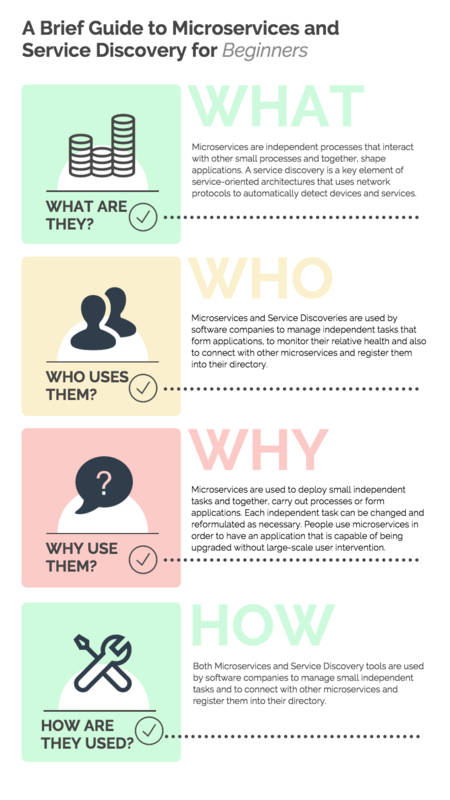 Who Uses Microservices and Service Discoveries? Microservices and Service Discoveries are used by software companies to manage independent tasks that form applications, to monitor their relative health and also to connect with other microservices and register them into their directory. Today, companies exist such as Datawire which allow you to ship features to clients or others as microservices. In doing so, these companies enable users of their services to respond to trends in the market and innovate in a timely manner. Users are also able to download services in whichever programming language their company is currently using. Why Do People Use Microservices and Service Discoveries? Microservices are used to deploy small independent tasks and together, carry out processes or form applications. Each independent task can be changed and reformulated as necessary. People use microservices in order to have an application that is capable of being upgraded without large-scale user intervention. Service Discovery tools are used by software companies to manage how processes, devices and services find one another and communicate. These tools often taken advantage of a common directory and register new microservices they encounter, after which they can later use and connect with. 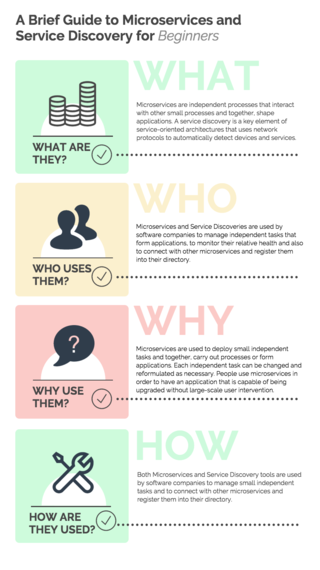 By having these tools, software companies can continue to register microservices and update their applications as they see fit. How Are Microservices and Service Discoveries Used? Both Microservices and Service Discovery tools are used by software companies to manage small independent tasks and to connect with other microservices and register them into their directory. In doing so, software companies not only have the ability to manage their own applications and make small changes without large-scale user interventions but can also manage how microservices connect with other microservices. In connecting with other microservices, software companies can gain a greater understanding of microservice health and whether or not to make changes to these independent tasks.